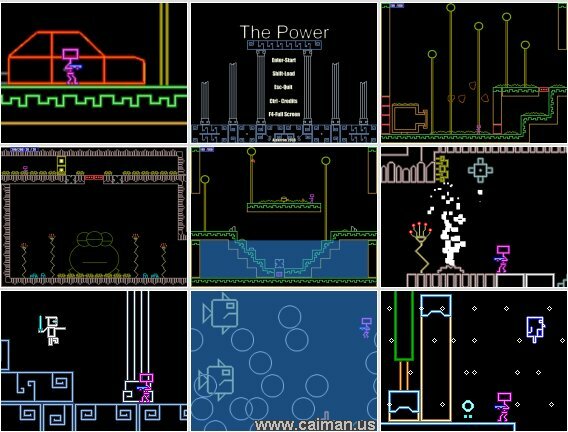 Caiman free games: The Power by Alexitron. 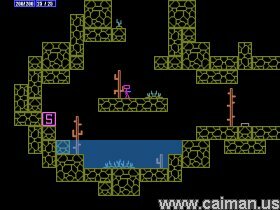 A great platformer / exploration game with nice sticky graphics. The gameplay let me think on Metroid. Explore the 5 worlds on one big planet. There are many items, weapons and upgrades to find. Everywhere a lot of enemies and there are also a bunch of big bosses. There are 2 different endings, depending if you get all items or not. I really enjoyed this great game and I must say that I am normally not a fan of sticky graphics, but the graphics of this game are very well finished! A must for all Metroid fans!!! Save game: Stand on a "S" block and press the down arrow. _You can now play using WASD for movement and UIOP for your items. _The first boss,second snow boss,first sword guys and the fish tank are now slightly easier.The second sword guys are now harder. _Hopefully I got rid of the "I died when the check point was created" problem.No guarantee. _How to Play and How to Save instructions have been slightly modified. - All room speeds changed from 30 to 60 , as a result nearly every object had to be edited , all speeds had to be reduced , all alarm timers had to be increased , all sprite speeds had to be increased , many animations needed additional images . A room speed of 60 makes the game run smoother and everything looks way better because of this . - The controls have been greatly improved , first we had : one button for every selection on the main menu and in game options , now we just select options with arrows up and down and enter .We also had one button for every weapon and item on the game weirdly placed in the middle of the keyboard ( C V B N ) now we have one primary fire button and one secondary fire button and you just press down to select secondary weapons . - I cleaned trough the code of almost every object eliminating unnecessary actions and variables . - Reduced the annoyance level of some enemies . - First weapon now has automatic fire . - Added variable jump height . - Room transition objects reduced from over a hundred to just 4 . - Minor sprite edits and additions . - Minor sound edits and additions . - Minor bug corrections . - Minor text edits .